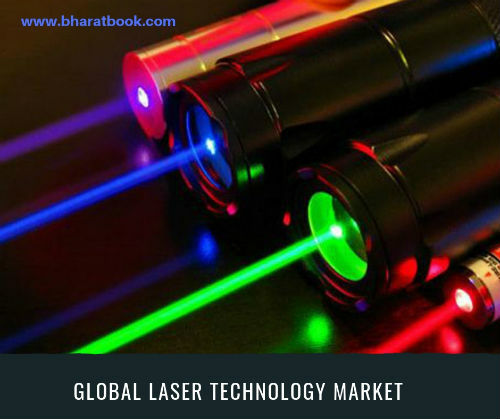 Bharat Book Bureau Provides the Trending Market Research Report on “Laser Technology Market by Type (Carbon Dioxide Laser, Fiber Laser, and Solid State Laser), Revenue (Laser Revenue and System Revenue), Application (Laser Processing and Optical Communications), End User, Geography - Global Forecast to 2024” under Media & Technology category. The report offers a collection of superior market research, market analysis, competitive intelligence and industry reports. The overall laser technology market is expected to grow from USD 12.9 billion in 2018 to USD 16.9 billion by 2024, at a CAGR of 4.65%. Huge demand from the healthcare vertical, enhanced performance over traditional material processing techniques, and shift toward production of nano and micro devices are the key factors driving the growth of this market. However, regulatory compliances could likely act as the restraint for the market’s growth. The market for others laser type is expected to grow at the highest CAGR within the overall laser technology market during the forecast period. The growth can be attributed to increasing demand for several lasers including X-ray laser, dye laser, excimer laser, argon laser, chemical laser, and helium-neon laser. Applications such as in dense plasmas, X-ray microscopy, medical imaging, aerospace & defense, and surface research boost demand for X-ray lasers; the ability to generate light pulses of various wavelengths drives excimer lasers’ demand. APAC is expected to account for the largest share of the laser technology market. Continuous demand for cost-effective and fast processing laser machine tools from semiconductor, automotive, industrial, and telecommunications verticals are expected to drive the growth of the laser technology market in APAC. APAC has been ahead in terms of adoption of laser technology products and solutions compared to other regions. The region’s huge population, increasing R&D investments, and growing manufacturing and electronics sectors are expected to drive the growth of the laser technology market. This report offers detailed insights into the laser technology market, segmented based on type, application, revenue, end user, and region. By type, the laser technology market has been segmented into CO2 laser, fiber laser, solid state laser, and others laser. By application, the market has been segmented into laser processing, optical communications, and others. By revenue, the laser technology market has been segmented into laser revenue and system revenue. By end user, the laser technology market has been segmented into telecommunications, industrial, semiconductor & electronics, commercial, aerospace & defense, automotive, medical, research, and others. The study forecasts the size of the market in 4 regions—North America, Europe, APAC, and RoW. This report segments the laser technology market comprehensively and provides closest approximations of the overall market’s size and its subsegments (across different types, end users, applications, revenue, and regions).